Just to follow-up on the recent posts, the Minnesota State Fair has decided to allow the public access to the swine barn this year, even in light of heightened risk of H3N2v flu. You can read all the details about the decision here. Am I a flu risk? 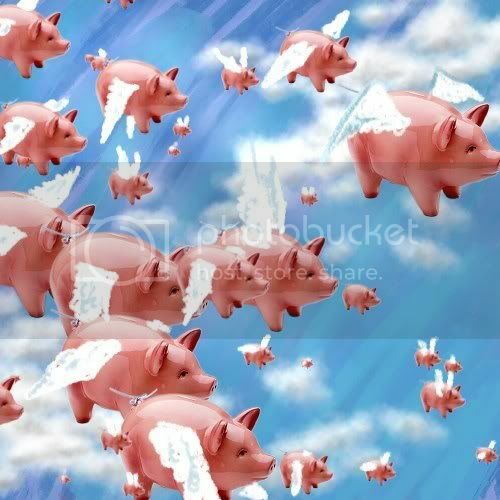 : A new strain of pig-borne flu virus my just shut down the doors to the public of the Minnesota State Fair swine barn this summer.Courtesy wattpublishingI don’t know if you are following the recent news about a new flu strain or not but it looks like the strain (H3N2v) is now in MN. 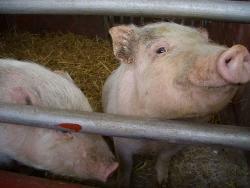 Pigs can spread this virus to other pigs and humans through airborne droplets (coughs and sneezes). If you are a meat eater, don’t worry you can’t catch it by eating pork. Will you be visiting the pig barns at the Minnesota State fair this year? – feel free to visit the swine barn unless you are in a high-risk group (Children under five and people age 65 and older, pregnant women and people with underlying health conditions like asthma, diabetes, heart disease or neurological problems). Remember don’t bring food in the barn (I’m always amazed when I see people eating in the barns at the fair, but this is due to food borne illness not the flu), and wash your hands after visiting the barns. – It is safe to visit the barns and fair officials have been taking extra precautions. , Director of the Center of Infectious Disease Research and Policy (CIDRAP) commented on MN public radio that he feels pigs should not be allowed at the fair – there is too much risk. The CIDRAP website has a summary of the situation as well. Do you think Dr. Osterholm is being alarmist or is the threat real? Will you be visiting the swine barn at the fair? What questions do you have about the situation? Do you need more information? I'd love to hear your thoughts! Before you turn me into bacon, I might give you the flu: Pigs will be under extra scrutiny at the Minnesota State Fair this year as a new strain of "swine flu" has been detected around the country.Courtesy titanium22The Minnesota State Fair starts next week and as you prepare to go, you just might want to assess your flu risk in the swine barn. Researchers at the University of Minnesota have just announced the results of a study they conducted at the 2009 fair, testing pigs for the H1N1 flu virus that was spreading widely across the nation at that time. Their findings showed that 19 percent of the pigs they tested at the fair that year had the virus. Some appeared to be perfectly healthy, exhibiting no flu symptoms. Two pig exhibitors from that year's fair from the same family came down with the flu from pigs they were showing, researchers added. Adding some urgency to the announcement of the study is a new nationwide outbreak of a different strain of swine flu this year: H3N2v. More than 150 people across the country have come down with symptoms of this new flu. So does this mean you should stay away from the pig barn? Not entirely, fair officials say. 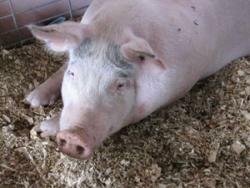 Veterinarians will be conducting extensive testing of all pigs coming to the fair this year. And the fair has issued this guidelines to help people decide how much time, if any, they should spend with the pigs. People who are at high risk for flu should also consider avoiding the swine exhibit entirely – including children younger than 5, pregnant women, people 65 and older and those with chronic conditions. You may now resume eating your pork chop on a stick, but first share with Science Buzz readers your thoughts about visiting the pig barn at this year's fair. Yet... this images suggests that swine and gel can live in harmony.Courtesy Ollie CrafoordDuh, right? I mean, of course swine conquers gel. We've all known that since we were kids; rock breaks scissors, scissors cuts paper, paper wraps swine, swine beats gel, gel covers rock. We all know the rules of the game. But now there's additional research to prove that swine beats gel. A recent study found that disinfectant hand gels, with "enhanced antiviral activity" (say what? ), didn't significantly reduce infection rates of rhinovirus (the cold) or A/H1N1 (swine flu) in the test group over a period of two and a half months. However, it's not necessarily the case that viruses are simply body-slamming antimicrobials in the octagon cage of your hands. The results suggest that aerosol transmission of the viruses might be more significant than hand-to-hand transmission—those sneaky swine flu viruses might be bypassing the gel altogether by, that's right, flying. Perhaps we have to take anti-infection measures to the next level. Officials in Cardiff confirmed today the world's first cases of human-to-human transmission of Tamiflu-resistant H1N1 influenza. It's not unexpected, but it is worrisome. Even though flu cases are down here in Minnesota and across the US, keep washing your hands! How do I know it is safe? "The recurring question is, 'How do we know it's safe?'" said Dr. Gregory Poland of the Mayo Clinic. What if, after getting a flu shot, a person goes home. then suddenly has a heart attack. Was the heart attack a side effect of the flu shot? More than 3,000 people a day have a heart attack. This happens when no flu shots are given. When no flu shots are given, from 14,000 to 19,000 miscarriages happen every week. When we start giving flu shots to 100s of millions of people, how do we differentiate side effects caused by the vaccination, from what would have happened even without the vaccination? This year there will be intense new monitoring. Harvard Medical School scientists are linking large insurance databases that cover up to 50 million people with vaccination registries around the country for real-time checks of whether people see a doctor in the weeks after a flu shot and why. The huge numbers make it possible to quickly compare rates of complaints among the vaccinated and unvaccinated, said the project leader, Dr. Richard Platt, Harvard's population medicine chief. Johns Hopkins University will direct e-mails to at least 100,000 vaccine recipients to track how they're feeling, including the smaller complaints that wouldn't prompt a doctor visit. If anything seems connected, researchers can call to follow up with detailed questions. The Centers for Disease Control and Prevention is preparing take-home cards that tell vaccine recipients how to report any suspected side effects to the nation's Vaccine Adverse Event Reporting system. However the flu season turns out, the extra vaccine tracking promises a lasting impact. "Part of what we hope is that it will teach us something about how to monitor the safety of all medical products quickly," said Harvard's Platt. How much do you really know about the new H1N1 flu? CNN's testing your knowledge about the virus. Answer these 10 questions and see how you do. 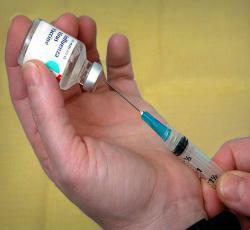 October is almost here, and so are more than 3 million doses of H1N1 flu vaccine. The vaccine is a the FluMist nasal spray type which is inhaled rather than injected. 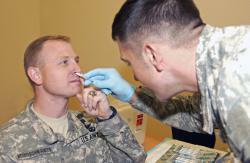 The nasal spray contains a weakened live virus, while injections contain killed and fragmented virus. The inhalation method gives a stronger immune reaction and is not recommended for pregnant women, people over 50 or those with asthma, heart disease or several other problems. The earlier than expected delivery will be be great for people in other high-risk groups though (health care workers, people caring for infants, and healthy young people). "The U.S. Food and Drug Administration announced Sept. 15 that it has approved four vaccines against the 2009 H1N1 influenza virus. The vaccines will be distributed nationally after the initial lots become available, which is expected within the next four weeks.